This month's stamp is a gorgeous paisley background image by Stampabilities! Tanya & I had alot of fun playing with this one, and we hope you will too! Here's our sample cards! 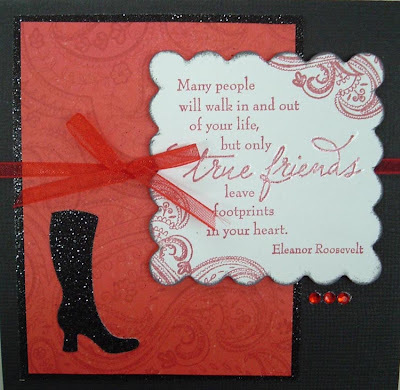 For this card I stamped tone-on-tone red ink on red Basic Grey paper. The boot is a new QuicKutz shape, punched out of Sugar Coated cardstock. 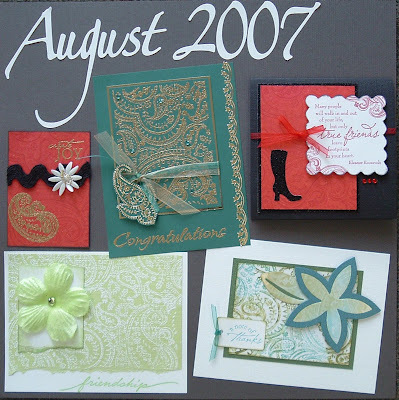 The saying & small paisley stamp used with the sentiment are also by Stampabilities. 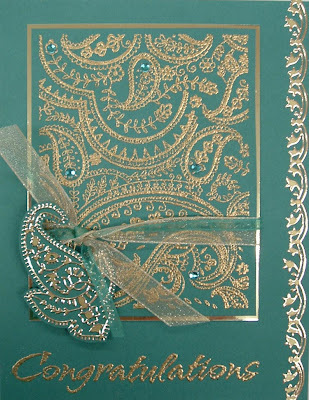 I went back to 'basics' with this card and love the look of the gold embossing! I paired it with some gold paisley peel off stickers & sheer ribbons. 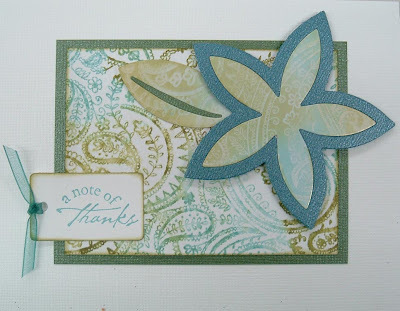 This card is my personal fave-- I played with distress ink on this one! I tapped 'peeled paint' & 'broken china' on the stamp then spritzed it with water before stamping. I then spritzed the paper again and set it aside to dry. For the die cut flower I did a versamark resist on glossy paper, and sponged the same colors of distress ink over the stamped image. 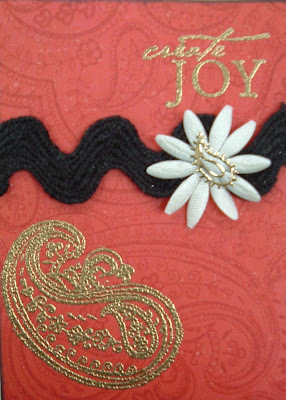 I used the QK Revolution to cut the flower and leaf out of my custom patterned paper and some Bazzill bling cardstock. The tag is also by QK & the sentiment is by Hero Arts. 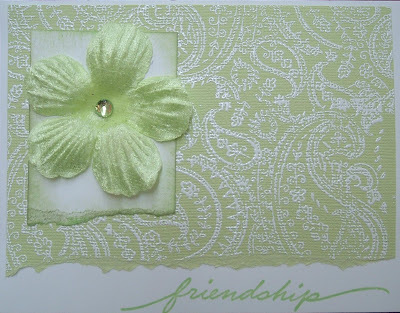 Tanya created this beauty-- stamped the paisley multiple times on lime paper and embossed it in white. It looks lovely finished off with a Bling Blossom by Bazzill! Just a simple ATC- like my red card, it's stamped red on red, I stamped and embossed in gold the sentiment & sm. paisley image, added ric-rac and a flower with a paisley sticker in the center.